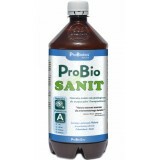 ProBioSANIT - is a natural resource based on useful microorganisms SCD ProBio Plus for sewage treatment plants, landfills and composting plants. It accelerates decay of organic matter, cleanses pipes and sewerage, eliminates rotting and enhances composting process. 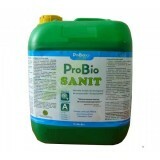 ProBio SANIT - is a natural preparation based on natural probiotics SCD ProBio Plus for sewage treatment plants, cesspits and composting. Accelerates decomposition of organic matter, clears out clogged pipes and sanitary sewers. Eliminates rotting processes, adjusts processes of composting.